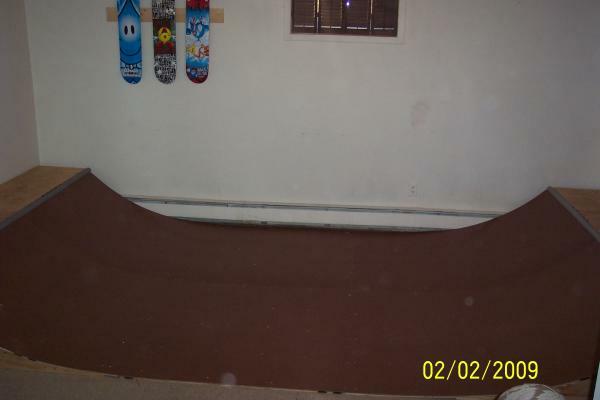 This is my first indoor really mini ramp it is 15' long, 8' wide and 18" tall (due to ceiling height being 7'6") platforms are 18" transitions are 60" radius and the flat is 5' .It cost me $225 total with all lumber and hardware and took about 10 hours total to complete (over 3 days a few hours a day ) . I used 3/4 ply on the sides and platform,8 2x4's on each end, the flat is laid directly on the floor mostly to keep the echo of the skating down to a minimum. ( My bedroom is above this room O.o) The side effect of this is also saving a few bucks on 2x4's. I used 3/8 ply on surface and covered that with 1/4 masonite. I used 1 1/2" PVC electrical conduit for grinds.It has not been skated on yet my kids will be on it today after school so i will update if it holds up .